If you are suffering from temporomandibular joint syndrome (TMJ) or temporomandibular disorder (TMD) symptoms, you are not alone! Although the vast majority of Americans suffer from TMJ, most do not relate their pain and symptoms to bad occlusion or bite. Many people with TMJ are not diagnosed as having the disorder, and, as a result, they are not treated correctly. When the teeth, facial muscles, and temporomandibular joints are out of alignment, the symptoms of TMJ/TMD arise. Luckily, there is help for people who suffer from TMJ-related pain, such as unexplained headaches, restless nights, and difficulty opening and chewing. By relaxing the muscles that move your jaw, Dr. Poe can reposition your bite to it’s optimal state, putting it in harmony with the jaw joint, facial muscles, and your teeth. The results lead to the immediate relief of pain and, in many cases, the reduction or elimination of current medications. 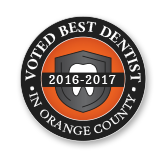 If you would like to learn more about neuromuscular dentistry, contact Orange County cosmetic dentist Dr. William Poe today. The muscles of the forehead play an important role in the positioning and closing of the jaw. If your bite is out of alignment, it can lead to tension in these muscles - a possible cause of tension headaches. If your bite is not corrected, the muscles may remain tense for long periods of time, resulting in painful headaches. Fortunately for headache sufferers, new technology allows Dr. Poe to evaluate these muscles and determine if your bite is the possible cause of your headache pain. If, after a physical examination, Dr. Poe determines that your bite is the cause of your headache pain, he may recommend that you wear an orthotic device. An orthotic is a custom made acrylic appliance that is worn over your teeth to adjust your bite to a correct alignment. Once you have worn the orthotic for a certain amount of time, both you and Dr. Poe will know for sure if the new bite position has resolved the headache problem. Without the pain and discomfort of headaches, Dr. Poe can help you decide which of several long term treatments options are best for you. If you are suffering from frequent headaches and suspect that your bite may be causing your pain, contact Dr. William Poe in Orange County today.